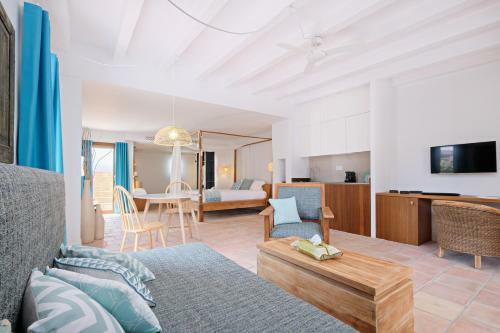 La Masía de Formentera in Sant Francesc is a small-scale hotel with 8 Rooms. 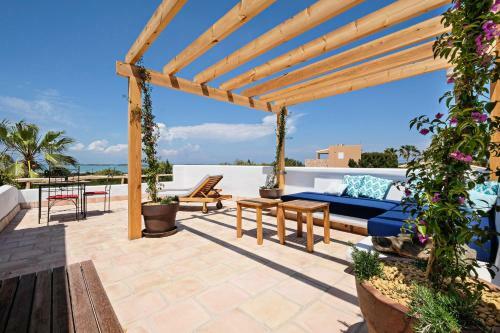 La Masia de Formentera offers an outdoor pool, a tennis court and a wellness area with a hot tub, and massage service. 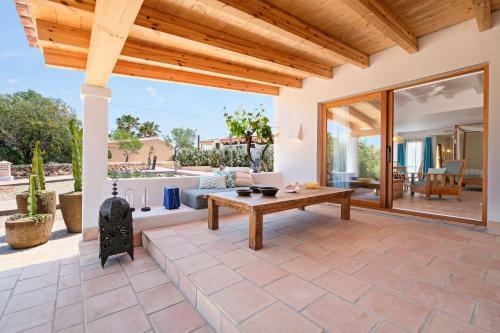 Each bungalow has a private terrace. La Masia’s air-conditioned bungalows are surrounded by Mediterranean gardens, filled with olive trees and lavender. All include a queen bedroom, a lounge and flat-screen TV. The Masía serves a personalised, à la carte breakfast on your terrace every morning until late. 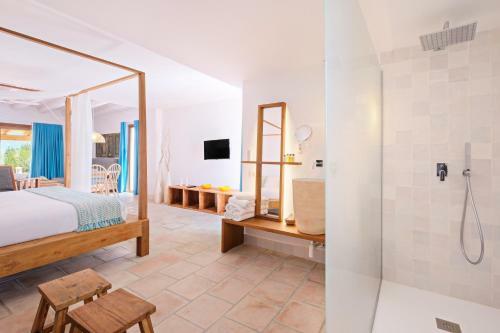 You can prepare meals in your bungalow’s modern kitchen, equipped with a m...icrowave, coffee maker and ceramic hob. Various bars and restaurants can be found in San Francisco Javier, within a 10-minute walk. Els Pujols is 3 km away, while La Savina ferry harbour is 4.5 km away. Free Wi-Fi is available in La Masia’s reception. Staff are happy to provide information about Formentera. 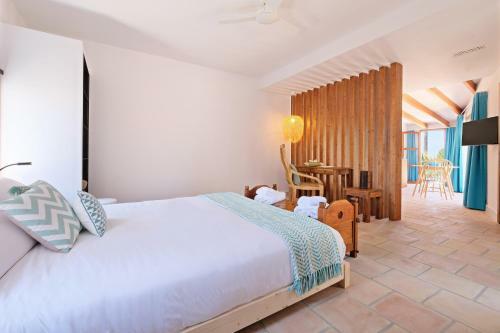 La Masia de Formentera offers an outdoor pool, a tennis court and a wellness area with a hot tub, and massage service. Each bungalow has a private ter...race. La Masia’s air-conditioned bungalows are surrounded by Mediterranean gardens, filled with olive trees and lavender. All include a queen bedroom, a lounge and flat-screen TV. The Masía serves a personalised, à la carte breakfast on your terrace every morning until late. 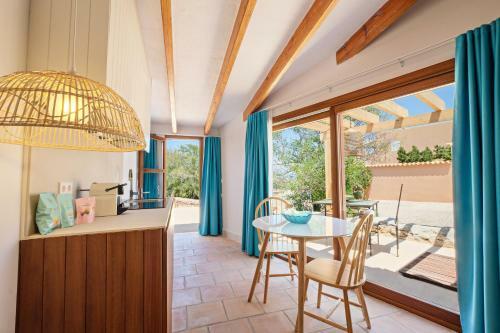 You can prepare meals in your bungalow’s modern kitchen, equipped with a microwave, coffee maker and ceramic hob. Various bars and restaurants can be found in San Francisco Javier, within a 10-minute walk. Els Pujols is 3 km away, while La Savina ferry harbour is 4.5 km away. Free Wi-Fi is available in La Masia’s reception. Staff are happy to provide information about Formentera. 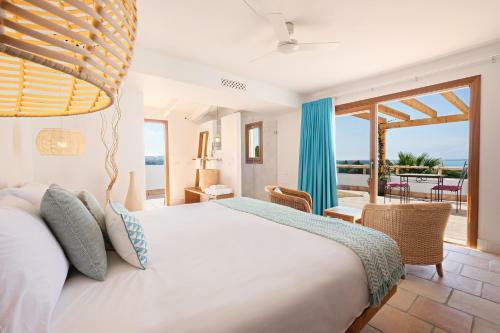 When would you like to stay at La Masía de Formentera?